WINONA, Minn. — Minnesota Conservatory for the Arts (MCA) will offer three unique eight-week workshops for adults ages 55 and older, thanks to a second-year of generous grant support from Aroha Philanthropies. The workshops, which will take place between April and November, will focus on creative journaling, watercolor painting, and a special intergenerational printmaking program that welcomes older adults and area youth to participate together. The first workshop “Creative Journaling” will run Mondays, April 1-May 20, from 4:45 to 6:15 p.m. at MCA, located at 1164 W. Howard St. This class will encourage participants to take time out of their day to channel their inner artist in written and visual expression. This process-based approach to creating will allow attendees to learn techniques in drawing, painting, and mixed media while using a journal format. Intuition will guide participants as they fill the pages. Back by popular demand, “The Ways of Watercolor” workshop will be offered on Mondays, June 10-Aug. 29, from 10 to 11:30 a.m. at MCA, located at 1164 W. Howard St. This workshop invites new and returning participants to immerse themselves in the ways of watercolor painting and color mixing. In this eight-session workshop, participants will engage with peers through artistic expression and observation. Through group and individual instruction, they’ll learn terms and techniques to create final pieces based on themes of their choice. Vitality Arts programs inspire and enable older adults to learn, make, and share the arts in ways that are novel, complex, and socially engaging. The work is driven by teaching artists whose creative process and understanding of older adults bring joy, connection, improved health and well-being, and a renewed sense of purpose to older adults in community and residential settings. MCA was selected as one of only 15 nonprofit organizations throughout Minnesota to receive a grant from Aroha Philanthropies through its new statewide initiative Seeding Vitality Arts MN. Registration for these workshops can be done in person at MCA, online at mca.smumn.edu, or by calling 507-453-5500. Each eight-week workshop costs $18. The broad field of creative aging encompasses many things: arts education, arts in health care, creativity for those with dementia, and more. Arts education programs — those that inspire and enable older adults to learn, make and share the arts in ways that are novel, complex and socially engaging — make up a subset of the creative aging field. 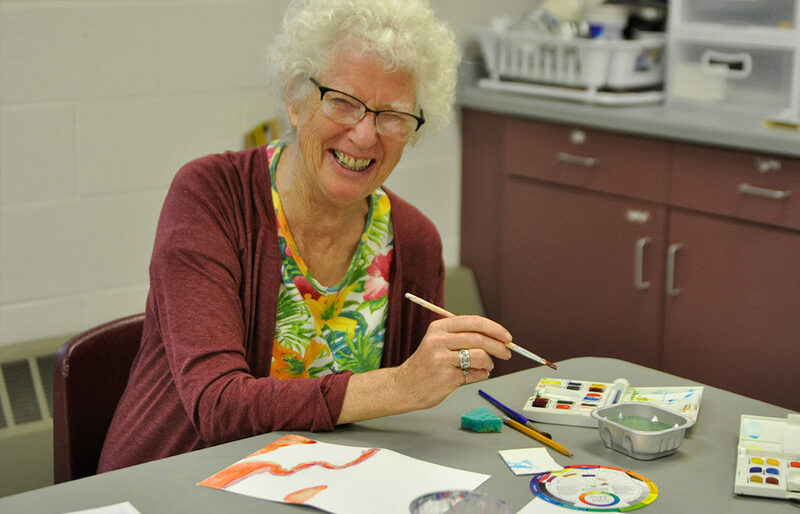 Often referred to as artful aging programs, they are led by teaching artists whose creative process and understanding of older adults bring connection, improved health and well-being, and a renewed sense of purpose to older adults in community and residential settings. At Aroha Philanthropies, we’ve come to view these programs as even more than artful aging. With the term “Vitality Arts,” we aim to champion arts programs that keep us vital, joyful, and engaged by unleashing the transformative power of creativity in those 55 and older. More information is available at vitalityarts.org. Aroha Philanthropies is devoted to the transformative power of the arts and creativity, inspiring vitality in those over 55, joy in children and youth, and humanity in adults with mental illness. We believe that learning, making, and sharing art enriches everyone throughout their lifetime. Aroha Philanthropies works to improve the quality of life of people 55 and older by encouraging the funding, development, and proliferation of arts programs designed to enhance longer lives, and by advancing the development of professional teaching artists working with those in their encore years. More information is available at arohaphilanthropies.org. Photo caption: Sharon Ormsby at the the “Ways of Watercolor” workshop last fall.